WASHINGTON — The Supreme Court is ordering a lower court to take a new look at a New York law that prohibits businesses from imposing fees on credit-card purchases. The court ruled unanimously Wednesday in a case about fees that merchants pay to credit-card issuers each time a customer charges a purchase. The fees typically range from 2 percent to 3 percent and generate more than $50 billion a year. The issue before the justices was whether the measure violates merchants’ free-speech rights. The federal appeals court in New York that upheld the law concluded that it regulated conduct, not speech. The justices said the law deals with speech and ordered the appeals court to re-evaluate it. 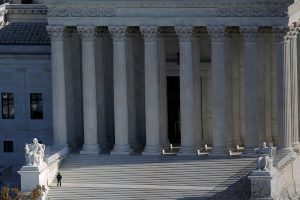 Left: The U.S. Supreme Court building is pictured in Washington, D.C. Photo by REUTERS/Carlos Barria.